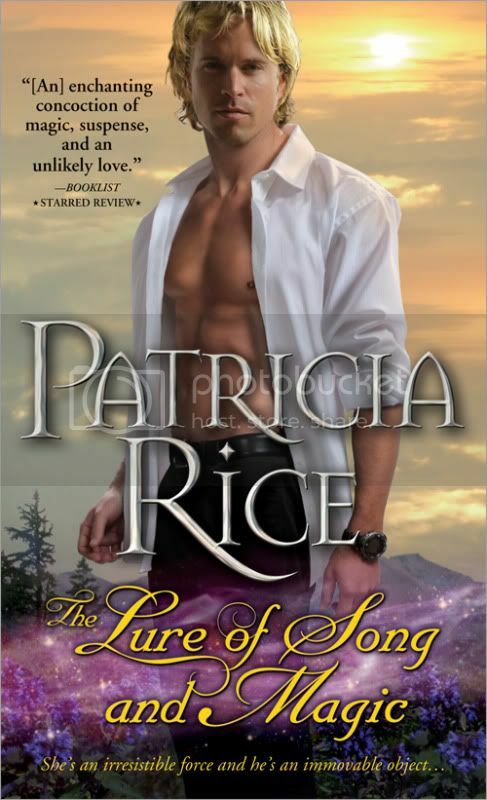 Today I have Patricia Rice over for an interview and at the end you can win her new book The Lure of Song and Magic. The contest is open to both US and International readers. 1. Could you tell me a little about yourself? PR: I’m half Irish. Storytelling is in my blood. Which means anything I tell you is suspect. I’ve been reading and writing pretty much since I was able to put two letters together. But the only possible career I could see using those abilities was journalism. (I am sooooo not patient enough to be a teacher!) And as an introvert, I sucked at journalism. But I’d been using my math skills since I was a kid in various jobs, so I majored in accounting, figuring I didn’t need to talk to people in that profession. And lo and behold, I got my first accounting job the same week I sold my first book! As soon as my books started selling, I said bye-bye math and shifted full time to my true love and haven’t looked back. Oh well, maybe I still do my own taxes. 2. Your newest book is called The Lure of Song and Magic? What it is about? PR: Short version? TV producer Dylan Ives (Oz) Oswin believes former singing sensation Pippa Syrene Malcolm holds the clue to finding his kidnapped son. Abandoned as a child, Syrene cares about the missing boy despite obnoxious Oz’s refusal to take no for an answer. But she refuses to unleash her dangerous siren's voice, even for a man who is impossible to deny... She’s already driven a man to his death with her voice once, she can’t bear to do so again. The story tells how Oz lures Pippa from her hermit life into the real world again, teaching her that passion isn’t always bad, and her strange gift can help as well as hurt. 3. Where did the inspiration for The Lure of Song and Magic come from? PR: Several places, actually. My original idea developed from the desire to see what happens to the descendants of my Magic series. In those books, the Ives were logical, scientific men and the Malcolms were fey psychic witches. (Sourcebooks is reissuing this series. Merely Magic already available and Must Be Magic will be out this spring) What kind of kid comes from a combination like these? But contractually, I wasn’t allowed to write another historical about these characters. And then I heard the Anonymous Four and their haunting siren voices and I wondered what would happen to a heroine whose voice was so passionate that she could lure men to their death, and voila, the brew was begun. 4. Poor Dylan (Oz) and Philippa (Pippa) have not had it easy in some aspects. Is this the common ground they can build something from? PR: Interesting question. I think their common ground lies in their strength and determination and passion, all of which probably did develop from their circumstances. Of course, those characteristics meant they hit head on at first, but once they had a common goal... It was just a matter of battling over how to reach it! By the end of the book, once they understand each other, it’s easy to see how they can blend their passions into one terrific whole that will protect their loved ones against the tragedies they’d experienced. 5. What makes Oz a great hero to fall for? PR: Doesn’t everyone want a rich, handsome man who lives in Santa Monica and has a stable full of cool cars? But if I tell you Oz’s real strength, I’ll give away a plot point. So let’s just say this man pays attention. We can all appreciate that! 6. Why do you think small town settings works so wonderfully in romance novels? PR: There are probably hundreds of reasons but one of the most important is that it’s so much easier to develop close relationships with the people around the characters—the grocer, the baker, the next door neighbor. For adults, friends are as important as families, and in romance, it’s good to know that the characters are capable of strong relationships. As a reader, we walk away knowing this couple can make it and they have a wonderful support system in place to guide them. 7. Do you have any advice for aspiring writers out there? PR: I know no one wants to hear this again, but my strongest recommendation is perseverance. Writing is not a career you choose, it chooses you. Writers have to write. But they don’t have to sell. That part takes iron guts and a hard head and a never-give-up attitude. I certainly wouldn't mind a handsome man with a stable full of cool cars! Complete bonus that the man pays attention to things as well, now I really want to read and find out just what exactly he pays attention to! For me, I love the paranormal aspect of a romance story just because it's such a departure from real life (not that a historical couldn't be the same way). I love all the extra dangers the supernatural brings! I like paranormal in romance because it makes it more alluring, takes it further away from the real allowing it to be something you really can only dream about. Maybe the paranormal makes love more real than fantasy? I can relate to the introvert thing-- but I got a journalism degree anyway. I actually liked hearing people's stories when I was working in the industry. It works for introverts because we get to have more in-depth conversations with people and don't have to deal with a lot of superficial chit-chat. Interesting story. I'm more of a cozy mystery gal though. For me, it's totally about the escapism. It's fun to believe the impossible is possible. Like believing that creatures of the night actually exist. I read Patricia's books in the 80's and then the children came (a good thing BTW;) and I would have never found my way back if not for other book bloggers. It is what I love about the blogging world. such a lovely group of readers here today! I guess I should have said I was also shy--interviewing people was painful! Nise, glad to see you reading again! I read fantasy and fairy tales as well as mythology, so you may be on to something there. I like the paranormal element in the books I read because it takes the story beyond the ordinary. The men are more manly. The women are, in general, able to handle a lot of problems without falling apart or being whiny. I guess it just takes me to a place that's not in my normal, somewhat boring life. Thanks or the giveaway. I do not love romance, pnr or otherwise. Rarely a romantic book or movie works for me, leaving anything else than stronger or weaker distaste. A handsome man with cool cars? No thanks, I still prefer horses. But, after all, I am only an old ugly toad. ;) A nice review, thank you! Paranormal adds a new interest and component into the story which is special and fascinating. many thanks. I enjoy the combination of romance and paranormal which is intriguing. Anything that adds spice is definitely appealing. So glad you got to quit your day job! Supernatural in romance just adds to the magic! Great interview ladies. The Lure of Song and Magic does sound good. I like small town settings in romance novels too. I do like a good paranormal romance. I think mainly because I like heroes who area bit different, who have a dark side. I also like the escapism of paranormal stories and I'm a sucker for romance. This looks like a fun book! I like touchs of PNR in my reads becasue it's nice to imagine something that couldn't/wouldn't happen in my everyday life. BTW- found your blog via a guest post on At Home With Books, and have now added you to my 'must read' list. I love the paranormal because it's just so much fun to read about someone with power, magic, special abilities, etc. that are so different than what I see in the "real" world. It just adds that special something to any story for me. Sounds very good, and such a purttty cover. ;) Thank you for the interview! Paranormal in romance expands the boundaries. Basically anything is possible. Thank you for the great interview ladies, I enjoyed reading it. I love paranormal aspects in romance, as the heroes can be so much stronger and alpha than normal men. A shifter for instance can be much more protective and possessive than we would allow our own boyfriend to be. You can imagine yourself in that world, dream about shifters and vampires being real. But thinking about it, I want horses instead of cars too. But that is just cos I am the lady of the castle. That is why it works for me too. Hi, I am so glad that you came on over from Alyce's place. I like paranormal in romance because it makes the story more interesting, and in a way, it gives readers something to indulge themselves with. Thank you for the interview--it was great! The reason I LOVE paranormal with my romance: I read romance to get away from the daily living, often the parts of life that are a drag or pessimism that I can't seem to get away from. Paranormal elements seem to up the ante to an even greater extent. I love the additional powers that allow people to overcome unbeatable odds or even fantasy worlds that I can get caught up in when MY world seems to hard. And, no matter what, the lovers get to overcome their struggles and live happily ever after--regardless of how it turns out in our real society. Thanks again for the interview and I look forward to the possibility of winning the contest!